Put a Band-Aid on It . . . .
That’s the practical remedy when we have those small cuts or blisters that we know will heal themselves in a short period of time, and there is no expectation any further complications will occur. It’s fast. It’s easy. It makes sense. What doesn’t make sense, is to use a Band-Aid in situations where an injury is more severe and requires medical attention. These situations require real treatment over time for the affected area to heal properly. For example, stitches might be required to insure the cut closes and heals without any further complications. 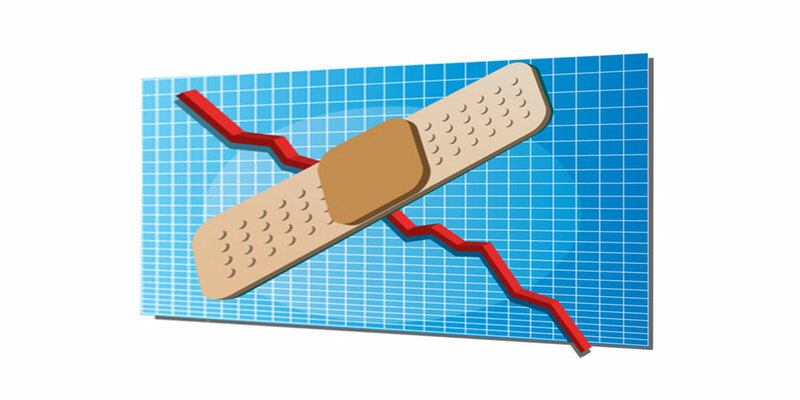 These scenarios are found in business with owners and management putting Band-Aids on problems needing greater care and a more in-depth analysis. Why does this happen? Here are some thoughts. 1. Owner / Management is unaware and not as intimately involved with the financial aspect of their business as they should be. Hands may not be on the wheel as they should be. 2. An inability to make assessments and analysis to see the problem for what it is and not to make a diagnosis on the outward appearance. What is below the surface creating the problem in the first place? Coming to a quick conclusion not based upon research to find the facts. 3. A breakdown in customer or vendor relationships. For example, being unaware of changes in a customer’s business that will affect future revenues. Or a major change in vendor capabilities or their pricing structure that will cause a major impact to your costing structure. A key customer’s sales have been falling across periods. Management, without contacting the customer, attributes the downturn to an unfounded reason when in fact the customer is in the process of changing suppliers, and they have been sourcing some of their product from the competition. Management, unaware of the facts, makes the typical quick-fix decisions such as reducing or eliminating overtime and some other non-material changes when actually they should have been making critical changes in their operation. 4. A propensity to REACT instead of RESPONDING as an owner or manager. Quick reactions, or slapping the Band-Aid on instead of creating a thoughtful response after the situation is understood. 5. The absence of wise, knowledgeable and savvy management personnel and other key advisors. 6. Let’s face the fact that Band-Aids do not provide any healing capacity, but protect or hide what is underneath them. Management, not wanting to lose face or perhaps out of pride may take temporary actions, but do not address the key problems. Owning or managing a business is not easy and there is much responsibility that comes along with the position. It requires a daily consistency with staying the course and adhering to the company goals, but most important as a leader one must be totally aware of the causes of the changes happening within the business. 1. Timely, accurate and reliable financial statements. 2. Critical intelligence on your customers and vendors. 3. Awareness of your industry and the influences in the world that may impact it. How do you respond to a problem? Are you one that immediately runs and gets the box of Band-Aids? Or do you assess the problem more closely in order to apply the correct remedy? Or it might be your company lacks the resources needed to properly address the situation. If you or your company lacks the resources to properly assess your business challenges there are advisory services available to provide finance, accounting, and strategic planning services. The help you need is not always within in your organization. Seek a trusted advisor who can assist you to get thru a challenging time. Clouser On Business is located in Portland, OR and is a provider of fractional CFO and Business Strategy Services and can be contacted at clouser@clouseronbusiness.com. Great article and short case study Clouser. As you know, I rip-off band-aids, perform major surgery, help heal the client, and then watch them excel. I love working with you and our clients.